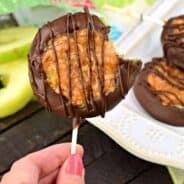 Looking for an easy, no bake dessert this holiday that feeds a crowd? 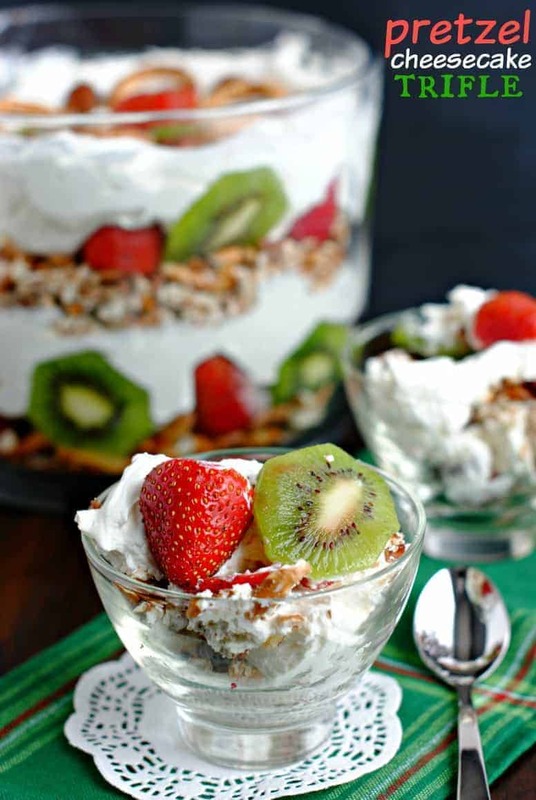 This Holiday Cheesecake Trifle with strawberries, kiwi, pretzels and pecans is a mouthwatering masterpiece! My aunt makes a delicious Strawberry Pretzel JELL-O every holiday. As our families have all expanded, we rarely get together for a meal over the holiday season, so I haven’t enjoyed that dish in years! The other day I was looking to use up some pantry items: an open bag of pretzels and an open package of pecans. I also have a fridge full of PHILADELPHIA Cream Cheese. That is no surprise! It’s the holidays and I stock up on the silver boxes! While racking my brain on what to make for a quick and easy dessert, I mashed together a bunch of family favorites: my mother in law’s no bake cheesecake recipe, my aunt’s pretzel JELL-O and a trifle. The outcome was so wonderful, I knew I wanted to share with you guys! If you’re looking for a way to celebrate the holidays in a little bit more of a stress-free way, try whipping up this trifle. 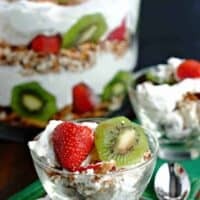 I included some fresh strawberries and kiwi to give this trifle a pop of holiday color! And the sweet cheesecake filling with the fresh fruit is the perfect way to end a meal! Start by adding the pretzels and pecans to a large ziploc bag. Close it tightly and press as much air out of it as possible. Place the bag on a large cutting board and smack it with a rolling pin or meat mallet. You don’t want it to become powder, so just a couple smacks will do the trick! To get your cheesecake creamy, be sure to start with PHILADELPHIA Cream Cheese. It’s made with fresh local milk and real wholesome cream (sounds pure to me)! Beat the cream cheese with the filling ingredients for a full 3-5 minutes using either an electric stand mixer (with whisk attachment) or handheld mixer. 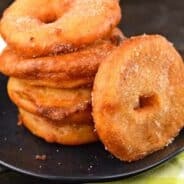 This will create a light and fluffy texture to your filling! When assembling the layers, use a clear glass bowl for a beautiful display! I use a bowl made for trifles, like this one. Store in refrigerator for at least two hours. Best served the same day. The pretzels will become softer in texture as more time passes (which I enjoyed, but not everyone does)! In a large ziploc bag, add pretzels and pecans. Smash gently and set aside. In a large mixing bowl (using an electric mixer or handheld mixer) beat cream cheese with sweetened condensed milk and lemon juice for 3-5 minutes until light and fluffy (scrape down sides of bowl as needed). Fold in Cool Whip. To assemble: pour half the pretzel mixture in bottom of a trifle bowl. Arrange half of the strawberries and kiwi on top of the pretzels (making sure to line them at the edges of the bowl first). Pour half the cheesecake mixture into the trifle and repeat the layers. 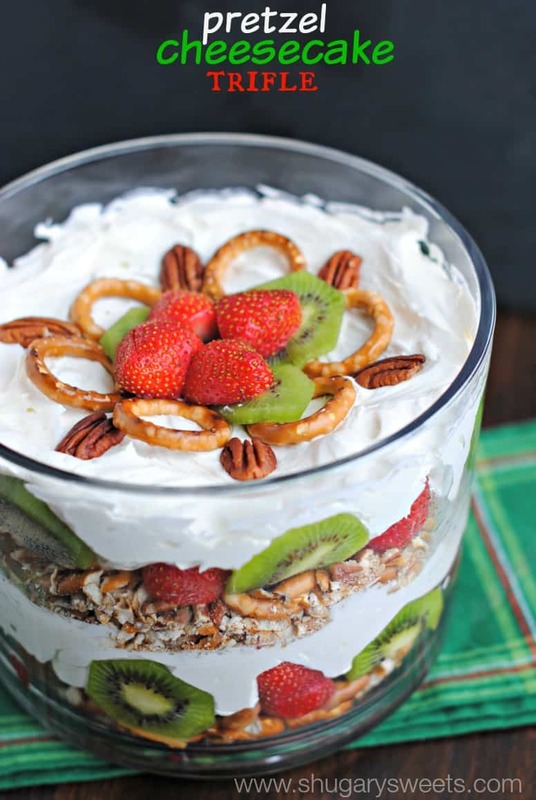 To garnish, add a few extra berries, kiwi, pretzels and pecans to the top. Cover with plastic wrap and refrigerate for at least two hours. Best enjoyed the same day! I have 5 blocks of PHILADELPHIA Cream Cheese in my fridge right now. I mean, who doesn’t? Ha. Love this Trifle! Pinned. Only 5? Kidding! Kinda 😉 Thank for pinning Amy! I re-invented that old fashioned Strawberry Pretzel Salad last year with a strawberry compote and real whipping cream so I know what pretzels can do to add a wonderful salty component. This is so festive too! Cream cheese and sweetened condensed milk is a deadly (amazing!!) combo…and one I could just eat by the spoonful 🙂 This looks like a perfect dessert and love that you used red and green fruit! I love how festive this looks with the kiwi and strawberries. I don’t use my trifle bowl nearly as often as I could. YES! Love everything about this! I am stocked up with Philadelphia cream cheese too! Gotta love the holiday season! Oh my gosh I bet this is AMAZING! We always have a stock of PHILADELPHIA Cream Cheese in our fridge, especially during the holidays! Love the colorful fruit in this trifle. Pinned. I love the idea of cream cheese and sweetened condensed milk. This trifle sounds amazing! My family loves making trifles – I think it’s because everything is always so “wow”-ed by the presentation. 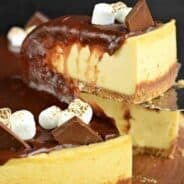 We have never made a cheesecake version, but that needs to change! This looks so good. I love that it’s so easy to make as well. What a great festive dessert! I love the pretty red and green from fresh fruit! Can I be like you when I grow up?? Ok, just added 4 more packages of Philadelphia cream cheese to my grocery list!! I usually get generic, but you have convinced me I need to stick with quality! Are you calling me old. You mean when you “grow up” old like me? Nah, it’s okay. Yes, you totally need to stick to the real deal. Trusssssttttt me. If it’s sweet and salty and cheesecake-y, it’s for me! Pinned.